Hey, how is one of my favorite authors today? Besides writing this great trilogy, you also teach college level English...How do you find time for them both? Since I have a MWF teaching schedule, I can write all day on Tuesdays and Thursdays. I also write in the evenings when everyone else has gone to sleep. that's my favorite time to write. When did you decide you wanted to be a writer? A teacher? What brought on the decision? When I was in the eighth grade, an uncle gave me his old college literature anthology. I fell in love with it! I read every single poem, play, and story and knew I wanted to have literature in my life always. Studying it led me to teach it on the college level. I had to put my writing dreams on hold for years because of juggling work and raising kids, but a few years ago, I began to invest more seriously in my writing and haven't looked back! Tracy Chevalier, Ann Patchett, JK Rowling, Tolkien, Stephanie Meyer, Suzanne Collins, Veronica Roth, Wally Lamb, the list goes on and on! Some authors say that their characters talk to them, do yours? They feel like real people with distinct personalities, and they let me know when I've written them in ways that don't jive with their characters. How did you come up with the idea for your trilogy? Why gods, and why those specific two? The eighth was a pivotal year in my life, because the answer to this question, like an earlier one, comes down to a book I read that year. Edith Hamilton's Mythology was on my Scholastic Book Club order form. I bought the book and read it over and over. I still read it! I love those old stories. I chose Hypnos and Thanatos when I came upon their stories while doing research. I hadn't heard of them before and was intrigued by these youngish twin brothers who lived with Hades in the Underworld. I was also inspired my the movie Meet Joe Black, in which Brad Pitt plays the role of Death. I liked the idea of a girl who loved life and all living things falling in love with death. Do you do anything special to celebrate the end of a novel? After I jump up and down and sing my dancing song, I usually invite the family to go to eat to celebrate. 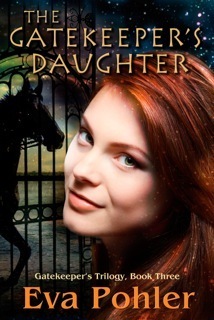 What's next after The Gatekeeper's Daughter? Does the story end there? NO! I'm half way through writing the first draft of The Gatekeeper's House (#4), which I will release on November 1st. 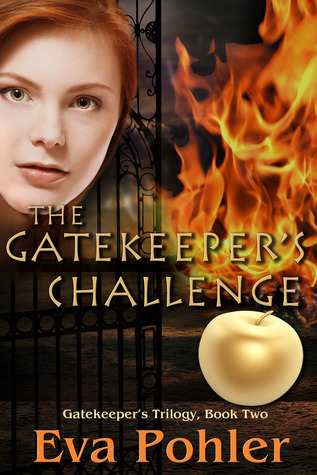 Two more books, The Gatekeeper's Secret (#5) and The Gatekeeper's Promise (#6) will come out next year. Thank you for taking time to talk with me today! Check out the rest of Eva's Blog Tour and enter her Giveaway!